Location: Pittwater YHA, North of Sydney. Applications: Please submit an online application NOW, total 32 places available, preference will be given to ‘senior’ architecture students with more than three years architectural education. Following receipt of applications, offers will be made, based on credentials, with preference to early applicants. Payment: Please send NO money until an offer is made. Payment of a non-refundable booking deposit of 25% will be required to confirm acceptance of an offer of a place. Balance of payment will be due by – latest mid-January 2019. If these deadlines are not met, places will be offered to other candidates. Payment instructions will be advised when offers are made. It has been called the ‘Total Immersion’ Summer School because, for a week, you live, eat, sleep, walk, talk, architecture in the superb landscape of the Kur-ing-gai National Park overlooking beautiful Pittwater north of Sydney, where both ‘masters’ Richard Leplastrier and Peter Stutchbury live and work, and ’round the corner’ from the Hawkesbury River, which we visit on a ferry cruise, and the boat only access to the home of Lindsay Johnston. Held since 2005, the annual event has attracted hundreds of architecture students and recent graduates from all over Australia and New Zealand, PNG, South Africa and as far afield as Bangladesh, China, UK, Ireland, Denmark, Argentina, India and Slovenia. Get away from the computer and the lecture room and get out and experience the landscape, learn to see again with the eye and the hand-drawing and be inspired by these architects and great teachers, visit some of their extraordinary houses and the offices of Peter Stutchbury in Newport. What we hear is that this week is an essential antidote to architecture school or ‘work’, and can re-invigorate your passion for architecture. 2019 will be the fifteenth residential architecture studio program for senior architecture students and recent graduates. Sunday 10 February. Assemble at coach pick-up at Central Station, Sydney at 12.00noon (exact location to be confirmed). Coach to Church Point Wharf. Ferry to Pittwater YHA including scenic tour of Pittwater. Settling in and introductions. Monday 11 February. Introductory talks by Richard Leplastrier and Peter Stutchbury. Walking visit to selected project site. Site analysis. Set up studio groups. Evening talk after supper – Richard Le3lastrier? Tuesday 12 February. Group working site and brief analysis. Tutorial discussions with Richard, Peter and Lindsay Johnston. Evening talk after supper – Peter Stutchbury? Wednesday 13 February. Crits on site and brief analysis. Talk on undertaking design conceptualisation. Studio activity continues. Perhaps a walk to Richard Leplastrier’s home at Lovett Bay. Evening talk after supper – guest? Thursday 14 February. Design, design –studio activity and tutorial review – heading for a design proposal. Supper on the run and working late to prepare a design submission. Friday 15 February. Design presentations. Critique and generous comment by tutors and additional guest(s). BBQ evening – relax and reflect. Saturday 16 February. Pack-up. Ferry to Church Point. Coach pick-up and visit to selected house by Peter Stutchbury and visit to Stutchbury offices at Newport Beach. Farewells and coach return to Central Sydney arrive about 6.00pm. The Architecture Foundation Australia is a not-for-profit organisation, the chair of which is Australia’s most internationally regarded architect, Glenn Murcutt. The foundation has been running Master Classes for professional architects and architecture students since 2001. Nearly 1000 people, young and old, have participated in our programs from over 80 nations around the world. The centrepiece program is the annual two-week Glenn Murcutt International Architecture Master Class that has been held at the Arthur and Yvonne Boyd Centre ‘Riversdale’. Other professional Master Classes have been held in New Zealand, USA, South America, South Africa, India, Bangladesh and Ireland. 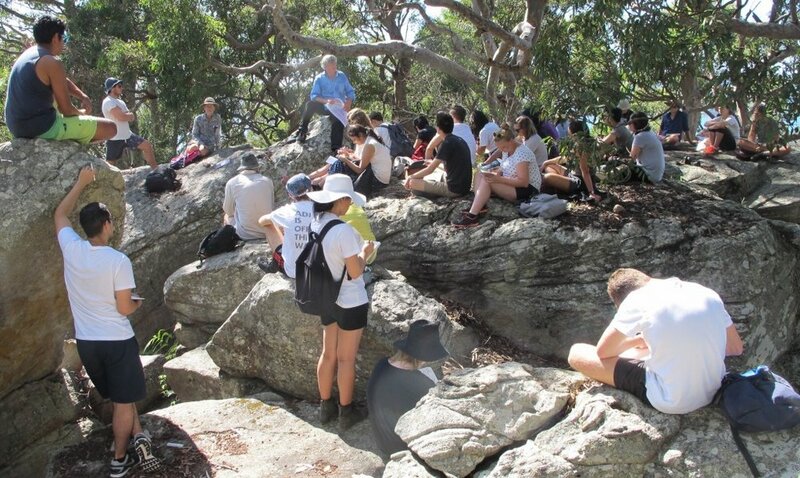 The annual one-week Summer School for senior architecture students and recent graduates has been held each year in February at the Pittwater YHA since 2005.